Apparently it wasn’t, because when New York Yankees pitcher Michael Pineda ambled out to the mound on April 10 with a visible splotch of brown goop on his right hand, Boston Red Sox manager John Farrell did nothing. Maybe Farrell truly didn’t care. Maybe he didn’t want to violate baseball’s code, and in the process open the door for opposing managers to call out Boston starters. Maybe he simply didn’t want to spare the calories it would take to make the long trip to the mound. Regardless, the substance magically disappeared in the fifth inning, either the result of an honest-to-goodness Lenten miracle or a properly conciliatory move on Pineda’s part. After the game, Pineda said the brown splotch was “dirt,” because professional athletes sweat, and apparently prefer mud cakes (and lies) to cooling towels. Yankees manager Joe Girardi refused to answer questions about the incident after the game. Former players stressed the difference between pine tar use, which enhances pitcher grip, and darker degrees of cheating, like actually doctoring the baseball to enhance movement. It seemed it would take a Canseco-esque provocateur to truly force the issue, and no man would be that foolish amid negligible sales projections for the pine-tar version of Juiced. Of course, nobody expected Pineda to have a veritable “I DARE YOU” sign pine-tarred on his neck the very next time he faced the Red Sox, leaving Farrell no choice but to defy baseball’s snitches-get-stitches ethos. As USA Today‘s Ted Berg noted, Pineda didn’t just try to drink in the freshman dorm; he rolled the keg by the RA’s open door, smiled, and invited him to join. Farrell asked the umpires to examine Pineda in the second inning of Wednesday’s game, and after examining the pitcher’s hands and glove and spinning him around like a dreidel, the umps spotted the brownie-batter smear on Pineda’s neck and gave him the boot. 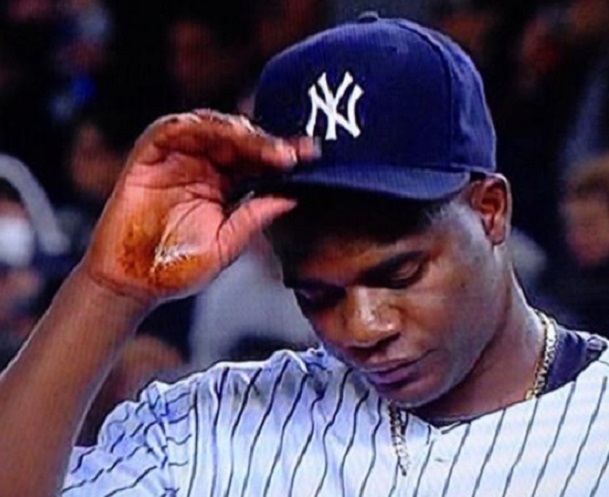 It remains to be seen what Pineda is going to do once he returns from his inevitable suspension, now that he can no longer liberally apply pine tar to exposed body parts and hope his opponents will allow him to publicly shame them. It’s too bad December is so many months away. Based on last night’s display, Pineda could probably grow Christmas trees out of his neck and sell them at a steep markup. Talk about gaining an edge. Do You Believe in the Bolivian Soccer Ghost?